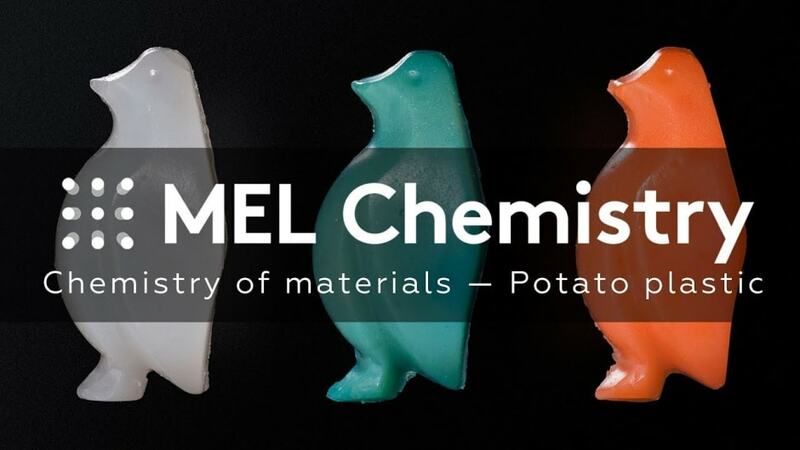 Make a polymer figure out of starch! 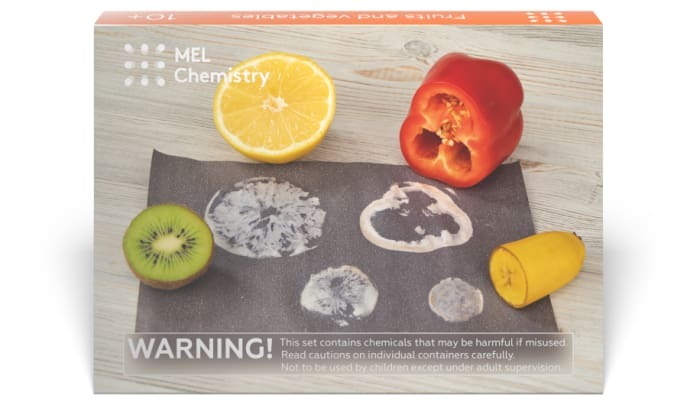 This experiment is included into "Fruits and vegetables" kit along with "Fruits vs. iodine" and "Universal ph indicator". Subscribe and get everything you need to do this experiments at home. Do not use water to extinguish the candles. The mixture thickened. Won’t it stick to the beaker? If the mixture has thickened, that means you’re doing everything correctly! Continue stirring it and keep the beaker on the stove. The mixture should thin again in about 20-30 minutes. The thickened mixture is difficult to stir. 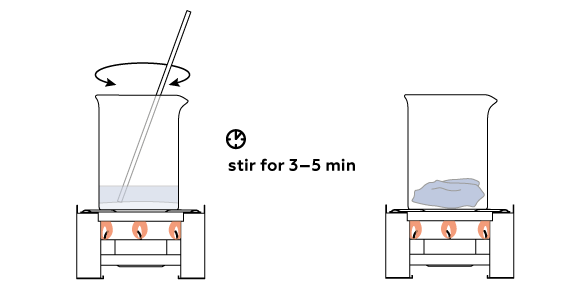 Use a towel or thick cloth to hold the beaker steady with one hand. This should make it easier to stir with your other hand. The penguin took hours to dry, and even now is still sticky. Why? The time it takes for a penguin to “get ready” really depends on the amount of starch used in the reaction. Another key factor is how long you heated the mixture. If it isn’t heated for long enough, the mass will contain too much water, and the penguin will take much longer to dry. 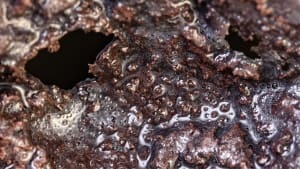 Conversely, should you overheat the mixture, too much water will evaporate, leaving the mass too thick, and it will be difficult to pour it into the mold. Once the mixture thickens, wait for 15-20 minutes to allow any excess water to evaporate. Keep an eye on the mixture – don’t let it become too thick or it will be hard to pour it into the mold. I would like to repeat the experiment, but I’m out of reagents. What can I do? You can use citric acid from your kitchen and over-the-counter glycerin. You’ll need about 1 g (half a teaspoon) of citric acid and 4–5 mL of glycerin. Add 20 mL of water and a couple drops of thymol blue or any food coloring. And there’s your mixture! Put the beaker on the flame diffuser and continue the experiment according to the instructions. Read on to find out how you can extract your own starch from a potato! I didn’t have enough time to pour the mixture into the mold. It solidified in the beaker. What to do? Don’t worry! First, try reheating the contents of the beaker. As soon as you can see that the mixture is liquid again, immediately pour it into the mold. Starch solidifies as it cools. 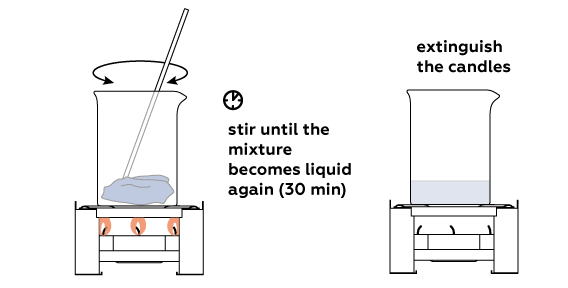 If this does not work, repeat the experiment and heat the mixture for a shorter amount of time. I know that potatoes contain starch. Can I use them for this experiment? Of course! If you extract the starch first. Take a raw potato (medium sized one should be fine) and grate it into a bowl. Add 150 mL of water and stir for 5 minutes. Cover your beaker with two layers of cheesecloth and carefully strain the liquid into the beaker. Squeeze the cheesecloth and set the grated potatoes aside. You only need the potato water to make the starch. Allow the starch to settle for about 20 minutes. With time, the starch will settle at the bottom of the beaker. The water may acquire a brown tint. Carefully pour out the excess water. Most of the starch will have precipitated to the bottom of the beaker. Still, avoid agitating the water as much as possible. Now you are ready to make penguin from starch you obtained! Start from step 2 of the instructions now. Portion out just the right amount of starch to fill the mold with plastic. Methylene blue is just a coloring. You can use other colorings as well. Starch won’t make a decent plastic on its own. Citric acid will chop starch molecules into shorter fragments, and glycerol will act as a lubricant for the molecules, making the plastic softer. Heat the mixture to get the reaction started. At first, the long starch molecules dissolve completely in the water and form a clot. Some time later, the citric acid cuts the starch molecules into small enough pieces to make the mixture liquid again. Starch plastic solidifies as it cools. Starch hydrolyzes when heated along with some citric acid. Long chains of starch molecules break down giving a much more elastic polymer. When cooled, it becomes solid in a couple of hours. You have made a penguin from a potato! Most plastics are polymers, that is, insanely long molecules consisting of a huge number of similar small pieces called monomers . Normally, plastics are made by stringing these monomer pieces together until the polymer chains reach just the right size to make plastic both strong and elastic. Starch is also a polymer, but its molecules are way too long to make a decent plastic; it would be too stiff and would crumble long before solidifying completely. To fix this, we need to do the opposite of the polymerization normally conducted during plastic production—we need to shorten the polymer chains. Starch molecules can be chopped into smaller pieces using acid . When the chains are of the right size, our liquid plastic can be poured into a mold to cool and solidify. Common plastics are made of petroleum products, and oil is a finite resource. Starch plastic, on the other hand, is derived from corn, potatoes and other plants. For this reason, starch plastics (and other bioplastics), although still rare, are becoming more prominent members of the plastic family. Starch is a naturally occurring compound. It is widely used in the food, farm, industrial and pharmaceutical industries. The most common sources of starch are potatoes and corn. It is also produced from rice, wheat, and sorghum. Starch belongs to the family of carbohydrates. Carbohydrates are vital to human life; without them, we wouldn’t survive. Carbohydrates you are likely familiar with include sucrose, glucose and fructose. These carbohydrates are responsible for the sweet taste of fruits. 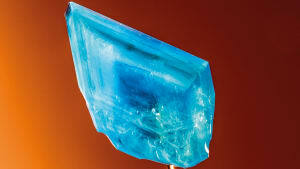 Regular white granulated sugar is actually crystals of sucrose. Starch, however, is somewhat different than these sugars because it is a polymer. Polymers are chemical compounds comprised of very long chains of atoms. Most often these chains consist of small, strongly bonded units called monomers. Such a comparison is no coincidence: indeed, a polymer molecule closely resembles a chain made of numerous links. Polymer molecules tend to be quite flexible, and in a solution they may tangle into odd structures and knots. Many carbohydrates have a sweet taste, but starch on its own is almost tasteless. Yet, if you hold a piece of unsweetened starchy food (such as bread or potato) in your mouth for some time, you will taste a slightly sweet flavour. This is because saliva starts to break down the long chains of starch into smaller molecules. These smaller molecules are essentially sugars, which explains the sweet taste. What happens to the starch? As we just discovered, molecules of starch may partially decompose when exposed to saliva. Another method to break down the bonds between the links in the starch is to expose it to an aqueous acidic solution. And that’s exactly what we’re doing. Initially, starch has a very developed structure: its numerous long chains are tangled with each other, and in some places these tangles are “stitched” or connected together. Thus, there are many “bridge” connections between the main chains. Acid breaks down these bonds and even some of the long chains themselves. As a result, the structure of starch becomes somewhat modified, and it turns from a solid compound into a moldable mass. Why does starch first aggregate into a lump, and only then turn into a thick liquid? Acid gradually takes its effect on starch. At first when heated, small granules of starch aggregate into one big lump. The mass becomes quite dense and difficult to stir. However, gradually the acid breaks down the bonds linking the starch, and the lump turns into a thick and viscous mass and slowly becomes quite fluid. Why does the liquid solidify into a pliable figure? First, with time the liquid cools down and the molecules of starch become less mobile. They settle tightly together into closely packed structures. Second, the material starts drying. 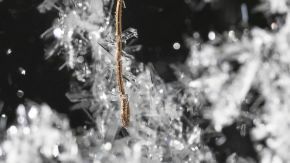 Fewer molecules of water are left between the starch molecules, which results in the hardening or thickening of the starch. In turn, this slowly leads to the transition from a liquid to a pliable material. Why do we add glycerin? The glycerin stops the hardening or thickening process. 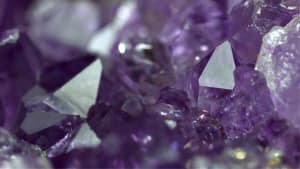 This process would have kept going and our material would have become solid and fragile as a crumbly cookie. Once dry, the figure would simply have fallen to pieces. In order to prevent this, it is necessary to partially separate the starch molecules from one another. 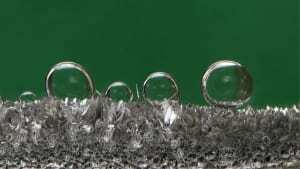 Water cannot serve this purpose because it easily evaporates, but glycerin can. Although glycerin is heavier than water, its molecules are as comfortable among starch molecules as water, and does not evaporate as easily. Therefore glycerin acts as a protector for the plastic consistency of the material, and it can be called a plasticizer. Why do we add methylene blue? Methylene blue is just for the color. You may conduct this experience without the methylene blue. Alternatively, you may use almost any food coloring to make figures of different colors!